Danni Wyatt admits it feels strange to be talking about the start of the second edition of the Kia Super League when it is still three months away. The competition is a big part of a huge summer for the women’s game in England with a World Cup starting in June followed at the end of July by the highlight of the domestic summer as six teams battle for Super League honours. Appropriately, this year’s competition was launched at Hove, the venue where the tournament reaches its climax on Friday, September 1 when Finals Day will be televised by Sky Sports. Children from a school in nearby Portslade joined players representing the six teams on Brighton beach and a local graffiti artist spray-painted the tournament logo onto the promenade. By the end of the summer Wyatt hopes that her efforts for England and her new Super League side, Southern Vipers, will have encouraged those youngsters who watched her belt the ball into the Brighton sea to take up the game. The 26-year-old’s hectic summer began with an England training camp in Abu Dhabi. The 45-degree heat was a little bit different to the temperatures England can expect in the East Midlands next month, when Derbyshire and Leicestershire will host the World Cup, but it was a rewarding trip nonetheless. “It was hard work for three weeks but great preparation for what’s ahead,” she said. “We played a lot of internal games against each other and a couple of matches against Ireland but the most important thing I think everyone got what they wanted out of that trip, what we will come up against in the World Cup – the different challenges. There are just a few days between the end of the World Cup and the start of the Super League. 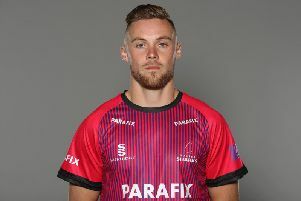 Wyatt has joined the reigning champions after playing for Lancashire Thunder in 2016 and the Vipers start the tournament against Western Storm in a repeat of last year’s final. They will also play one of their home matches in Sussex, welcoming Yorkshire Diamonds to the famous Arundel Castle ground on Saturday August 26. “It will soon come around and I’m looking forward to it,” she added. “The standard of the competition last year was good and with a lot of the top players staying on after the World Cup it will be even stronger this year.